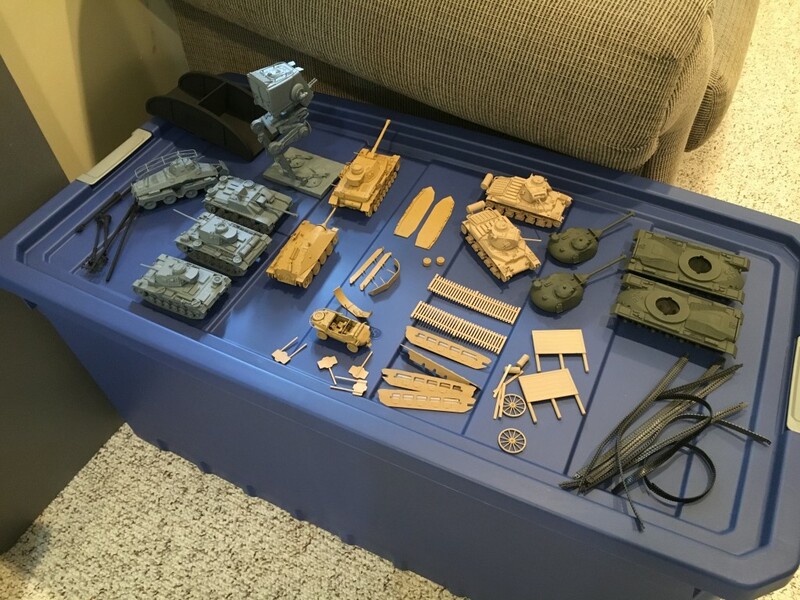 Labor Day Weekend Hobby Stuff | H.A.W.K.S. Last week I spent the evenings assembling a stack of 1:48 scale WWII and Star Wars kits. Over the weekend I had a chance to finish them up and base spray them. In addition to a reinforced platoon of US Marines and a handful of Fallschirmjaegers, you can see the weekend results in the picture above. These vehicles are waiting for next weekend when I will break out the airbrush and some some camouflage and/or weathering. The vehicles sprayed gray will merely get some highlighting and some weathering. The German vehicles in desert yellow will get a full camouflage scheme. The British Matildas have a unique camo scheme that I will try to reproduce. The M-48s will probably just get a little weathering. Most of the vehicles will be used in Combat Patrol. The M-48s likely will be used against aliens, Godzilla, or giant ants using GASLIGHT. Very cool – I always liked Matilda’s!